Attack on Titan Captain Levi Tamashii Buddies Mini-Statue:Grab your Three Dimensional Maneuver Gear and get in on the action becauseAttack on Titanis coming in a cool, compact, and collectible size to Tamashii Buddies! Levi stands ready for battle in front of the Survey Corps symbol on the interchangeable display card. 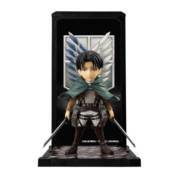 Protect your desk from nasty Titans with arguably the strongest member of the Survey Corps. Each Tamashii Buddies product comes with an attached stage, display card, and frame set. You can also stack with any other Buddies you own!